This was a decadent tasting but relatively healthy lunch that I enjoyed immensely. 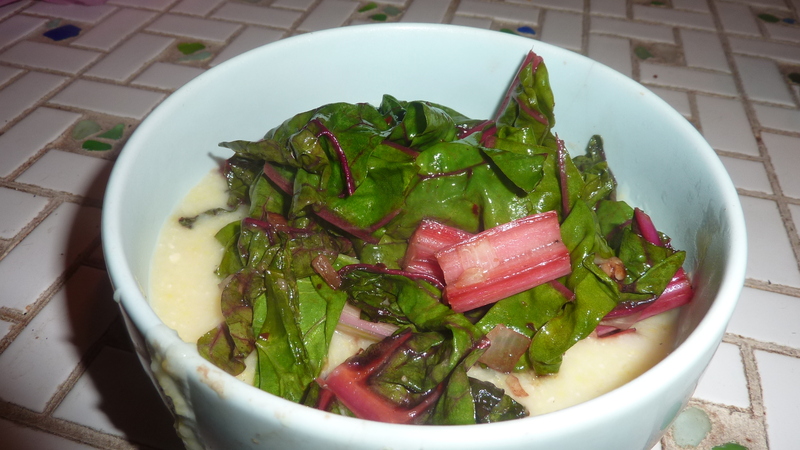 The creamy polenta works well with the texture of the Swiss chard stems. The tangy flavor of the goat cheese compliments the slightly sweet, slightly acidic flavor of the balsamic. Both are balanced out by a generous helping of spicy crushed red pepper flakes and a healthy dose of garlic. As an added bonus, this dish is really pretty thanks to the colorful Swiss chard stems and bright green leaves. If you wanted to make this more substantial, a poached egg on top would be a welcome addition to the flavor party. In a medium saucepan, bring water to a boil. Whisk in polenta, and reduce heat to medium low. Whisking frequently, cook until polenta is cooked through and most of the water is evaporated, about 20 minutes. Add goat cheese and milk and whisk to combine. Cook another 5 minutes until milk is absorbed. Season to taste with salt and pepper. Prepare the Swiss chard for cooking by cutting off the tough ends of the stems. Line up the ends of the stems of the Swiss chard and cut every 2-3″ width wide. Set aside. Heat olive oil and butter in a large saute pan over medium heat. Add onions and cook until soft and translucent, about 2 minutes. Add garlic and cook until fragrant, about 30 seconds. Add Swiss chard and saute, stirring frequently, for 3-4 minutes or until tender. Add crushed red pepper flakes and balsamic vinegar. Cook another 30 seconds to one minute, until balsamic is mostly evaporated. Season to taste with salt and pepper. Serve Swiss chard over cooked polenta. Who among us doesn’t love a crumbly, cheesy biscuit? Two kinds of people: liars and people who don’t eat cheese. And who among us doesn’t love that age-old combination of spinach and feta cheese? Again, two kinds of people: liars and people who don’t eat cheese. 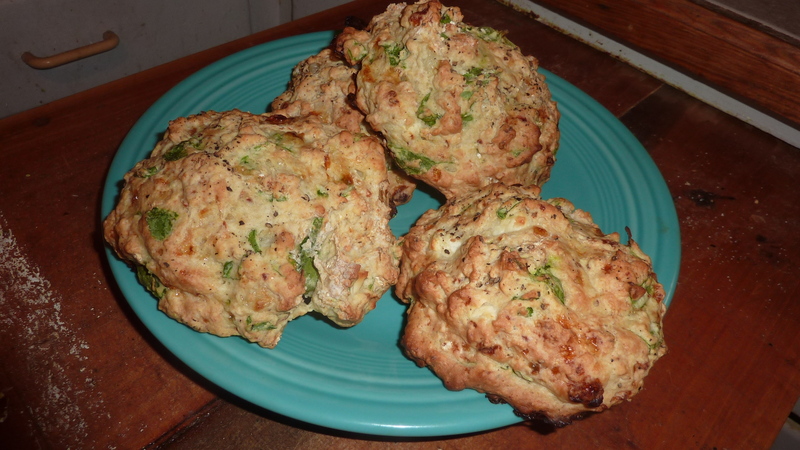 I decided to combine those two loves by adapting my savory scone recipe into these cheesy, crumbly drop biscuits. Thanks to a day of rain, the house had cooled down and there was no reason to fear a hot oven – especially because these have a relatively quick baking time of twenty to twenty five minutes. It’s an added bonus that these take about ten minutes to whip up and slide into the oven. These were absolutely ridiculously good. A crispy, crunchy crust encases a tender, creamy, cheesy interior. The spice from the crushed red pepper flakes plays well off of the tangy feta, creamy cottage cheese, and fresh, earthy, spinach. These taste seriously, insanely indulgent – even though they aren’t – and make for a great on-the-go breakfast or snack. Combine flour, baking powder, and salt in a large bowl. Add cheeses and gently combine with a fork. Add spinach and gently combine with the fork. Beat together the milk and egg. Using your hands, gently fold it into the flour mixture. When the dough just barely comes together, turn it out onto a lightly floured surface. Be very careful to not overwork the dough. I turn it out about 2-3 kneads before I think I really should. Sprinkle with a bit more flour. Form into a disc about 1″ thick. Form into 6 ball-shaped biscuits. Spray a parchment paper or tinfoil lined baking sheet with nonstick cooking spray. Bake 20-25 minutes or until slightly golden brown. These lightened-up chile rellenos were so darned tasty I had to come out of hibernation to post them. Although I love classic chile rellenos, dripping with cheese and stuffed with meat, I decided to lighten them up a bit and make a version both Zak and I could enjoy. So I dialed down the cheese, adding just enough for that creamy, cheesy element that is distinctive of a chille relleno, but not so much it overwhelmed the dish. I substituted quinoa for a meat product, adding some texture, nutty flavor, and healthy protein. Instead of deep-frying the chiles, I pan fried them in relatively heart-healthy canola oil. 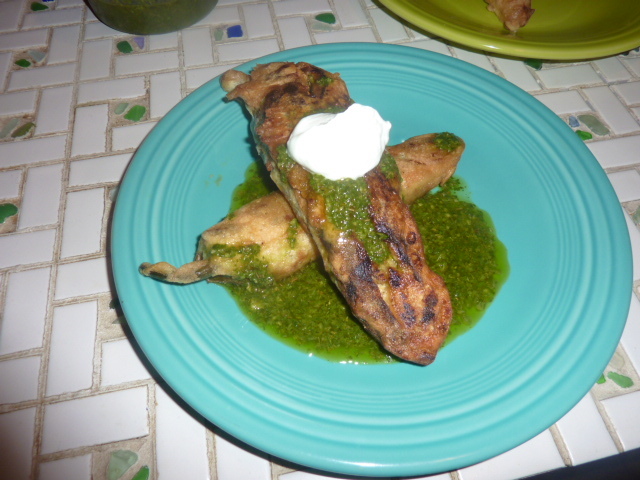 Served with Greek yogurt instead of sour cream and a bright, fresh, and flavorful chilantro chimichurri, these were absolutely excellent. The crunchy exterior gives way to the slightly spicy pepper and cheesy, nutty interior that is bursting with spices. Rather than traditional poblanos, I used a mixture of cubanelles, which are relatively sweet and not very spicy, and Hungarian hots, which vary in spiciness depending on the pepper and range from relatively mild to pretty hot. You can, of course, use poblanos – they did not have them at the store we went to, and I decided to throw caution to the wind and make some substitutions. I was very pleased with the results, and liked having one sweeter and one spicier chile per plate. Spray a cast iron skillet with non-stick cooking spray and heat over medium-high heat for about two minutes. Using a pair of tongs, add the peppers, working in batches if necessary. Cook the peppers about 3 minutes per side until skins are blistered and blackening. Transfer to a ziplock bag, and immediately shut the bag to allow the pepper to steam. Let sit for 15-20 minutes, or until peppers are softened. Carefully peel the skins from the peppers. Set aside the peppers, discarding the skins. While peppers are steaming, add quinoa and water to a medium-sized sauce pan. Bring water to a boil over medium-high heat. Reduce heat to medium-low, cover, and simmer for 15 minutes or until water is absorbed and quinoa is fluffy. Transfer quinoa to a large mixing bowl. Add cream cheese, cheddar cheese, cumin, garlic powder, oregano, and chile powder. Using your hands or a wooden spoon, combine well. Gently fold the egg yolks into the egg whites. Place flour and egg whites in two separate shallow pans. Add canola oil to a cast iron frying pan and heat over medium high heat until shimmering but not smoking. Cut slit lengthwise down each of the peppers, removing seeds and stems if desired. Do so carefully, so as not to tear the peppers. Stuff the peppers with the quinoa and cheese mixture so that you can close the peppers by folding edges of the slit over one another by about 1/8-1/4″. Take a pepper and dredge lightly in the flour, then in the egg mixture. Transfer directly to the oil. Fry the peppers about 3 minutes per side or until golden brown and crispy, working in batches if necessary. Serve with cilantro chimichurri and sour cream or plain Greek yogurt. Add garlic to the bowl of a food processor. Pulse until roughly chopped. Add cilantro and pulse until also roughly chopped. Add chile powder and red wine vinegar and pulse a few times to combine. With machine running, slowly drizzle in olive oil. Taste for seasonings, and add salt and pepper as necessary. Though relatively easy and quick, this dish is packed with unique and bright flavors. 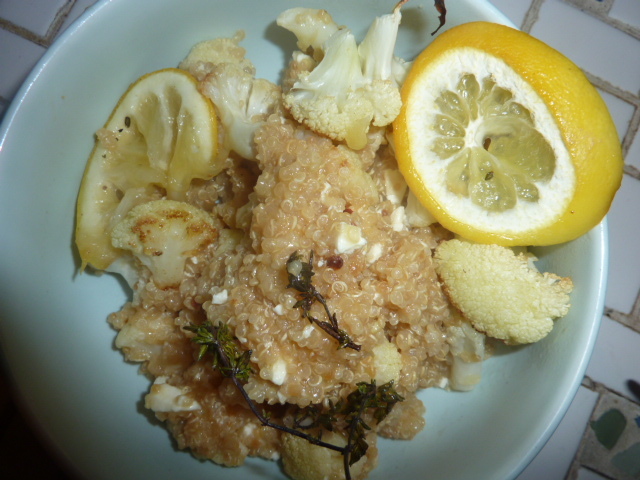 The acidity and slight bitterness of the roasted lemon works wonderfully with the nuttiness of the quinoa. Cauliflower really takes on a new dimension of tastiness when it’s roasted, giving it a nice hint of sweetness from the slight caramelization. The feta adds a perfect saltiness without overwhelming the rest of the flavors. Finally, the herbaceous flavor of the thyme really ties the whole dish together. I particularly loved how healthy this was. Quinoa is high in protein and low in fat, olive oil is chock full of good fats, and the lemon juice has loads of vitamin C. Though cheese is never the healthiest thing on a dish, there is a relatively small amount of feta. On a tinfoil-lined baking sheet, toss together 1 tbs. olive oil, cauliflower, thyme, and lemon slices. Season with salt and pepper to taste. Place in oven and roast for 30 minutes, tossing occasionally. When done cooking, remove lemon slices and thyme. Pluck 2-3 of the thyme sprigs of their leaves and set aside. Meanwhile, rinse quinoa with cold water. Bring 2 cups of water to boil. Add quinoa. Turn down to medium low, cover, and simmer for 15-20 minutes until water is absorbed. While quinoa is cooking, whisk together lemon juice, olive oil, thyme leaves, and pepper flakes. In a large bowl, toss together cauliflower, quinoa, feta, and dressing. Serve at any temperature. I know this is a pictureless post, but I made this to bring to a Superbowl party and didn’t think to photograph it at the time. But it was so good I couldn’t pass up the opportunity to post it. The creaminess of the mascarpone and mozzarella works beautifully with the sharpness of the parmesan, brightness of the artichoke hearts, and heat from the hot sauce and chile flakes. The rich roasted garlic really brings everything together. The textures are also a great match, with the crispy panko bread crumbs working beautifully with the melt-y, creamy cheese. Basically, this dip was satisfying and addictive, and I couldn’t stop going back for one more chip or cracker full of it. I really can’t say enough about how delicious this was – it was a true crowd pleaser. The hint of spice is what really takes this over the top. Somehow we managed to have a little of this leftover (we all had to save some room for the salad, chili, and the best key lime pie I’ve ever eaten), so I mixed it up with some cooked noodles and baked it for a really decadent macaroni and cheese. Cut off top 1/4″ of garlic head. Place on a square of tinfoil and drizzle with olive oil. Wrap the foil around the garlic. Transfer to oven and roast 45 minutes, or until garlic cloves are softened and golden brown. Squeeze garlic cloves into a medium mixing bowl. Mash with a fork until paste consistency. Add all ingredients except 2 tbs. parmesan, panko, and butter. Stir to combine. Taste for seasonings, and adjust as necessary. Transfer to a 3 cup baking dish. Set aside. Mix together 2 tbs. parmesan cheese, panko, and melted butter. Spread in an even layer across the top of the dip. Transfer to oven and bake, uncovered, 20-25 minutes until cheese is bubbling and topping is golden brown.